Check out this well written blog by Michael Mace at Mobile Opportunity on the war ahead between Apple and Nokia. 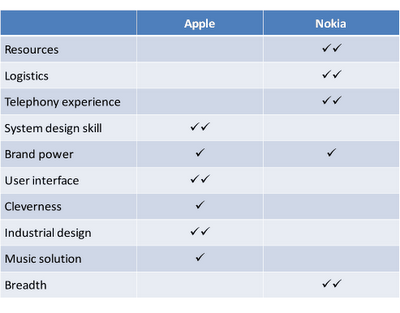 Check out the differences between Apple and Nokia below and its going to be exciting to see how these 2 giants will be competing with each other. Its hard to comment who will win at the end of the day but one thing for sure, consumers are going to be the real beneficiary. For those who are not ready for the war, its going to be hard and difficult times ahead and if i were them, I will either run very fast to catch up or re-think my whole strategy again or pack my bags and leave the industry. Who do you reckon will win the war?